Easy on the wallet yet with much potential power thanks to important additions such as MIDI and VSTi support, Mixcraft 4 is a significant step up from v3. Great value. Easy to use. Acidized WAV and Apple Loops support. Handy GM sounds included. Instrument stacking in presets. Loop mode glitches. Beatmatching not great. All the action takes place in one window. The tempo of long audio files is automatically detected, making Mixcraft suitable for remixers. Since the arrival of GarageBand on the Mac, the PC´s established eJay and Magix Music Studio franchises have begun to look increasingly stale. Thankfully, Acoustica has a little something up its sleeve in the shape of Mixcraft 4, an audio/ MIDI sequencer that bears more than a passing resemblance to Apple´s easy-to-use music production software. 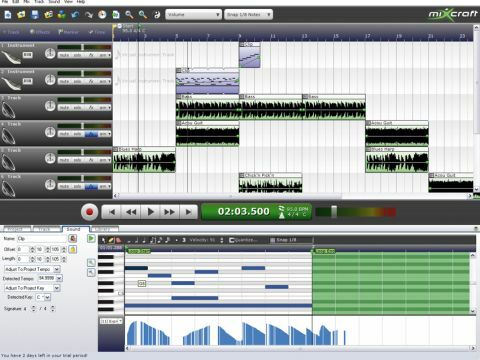 Mixcraft 4 has clearly been influenced by GarageBand in terms of both visual appearance and functionality. Everything in the program is displayed in a single screen, the majority of which is taken up with the Sound Workspace. This is where the software´s audio and virtual instrument/MIDI tracks are located, which work pretty much as you´d expect. Plug-ins in VST and DirectX formats are supported. MIDI and virtual instrument support is the single biggest new feature in Mixcraft 4. You can record and play back MIDI data, and there´s an all-new piano roll editor. It´s got the standard features - quantise, snap-to-grid, MIDI CC lanes - and it´s a doddle to use. One drawback, however, is that it you can´t control VST parameters directly from it, so this would be a nice addition for an update. Virtual instrument tracks can be routed to play VSTi format plug-ins, a selection of which is provided with the software. These include MinimogueVA and Impulse (two freeware virtual analogue synths), VB3 Organ (a cutdown version of the commercial VB3 instrument from MrRay creators Soundfonts.it), a full complement of General MIDI sounds, and a couple of big sampled grand pianos. As MinimogueVA and Impulse can be downloaded for free from the net, their presence doesn´t add any monetary value to the package as such, although having them ready and waiting when you load the program up is nice, and the relatively advanced preset sound system means you can load up multi-layered, key-zoned instrument patches complete with VST effects in a manner similar to Cubase´s track presets. Very clever! VB3 Organ is exclusive to Mixcraft 4, but it´s hardly going to set the world alight with its middling B3 emulation. The General MIDI sounds (aka Acoustica Instruments), however, are surprisingly good. These kinds of sounds are always useful, especially for those who are more interested in making more ‘traditional´ music, as opposed to synth-centric electronic pieces. As well as the smattering of instruments, you also get a selection of bundled VST effects, which includes the freeware Kjaerhus Classic series, a couple of Voxengo´s freeware plug-ins (a rebadged Boogex amp sim and SPAN spectral analyser), and a selection of Acoustica´s own effects, such as Chorus, Compressor and Distortion. Again, those who are already au fait with the world of free software might not see the value in these effects, but they´re utilised well in some of the preset instrument effect chains, and are eminently usable in their own right. Indeed, these particular devices are permanent fixtures in the plug-ins folders of many musicians, and we can´t knock Acoustica for their approach, as presumably this has enabled them to invest more development resources in the core application that is Mixcraft. Plug-ins aside, the package also ships with hundreds of loops and samples that are categorised by style, tempo and key, making it easy to quickly knock together tracks, eJay-style. Mixcraft 4 is capable of importing both Acidized WAVs and Apple Loops, and its creators suggest using it as a tool for creating your own bootlegs and mashups. As with Mixcraft 3, audio tracks can be set to record from your audio interface´s inputs, and multiple tracks can be armed simultaneously, facilitating the recording of drum kits, full bands and the like. You can apply effects to your recordings too, as well as placing them on the master channel (eg, the Kjaerhus Classic Limiter), to create a solid-sounding mixdown that´s ‘ready for CD´. Other cool features include the ability to trigger multiple layers of instruments from a single track and, as we mentioned, save those mega-patches in a single preset (useful when trying to coax larger-than-life sounds out of soft synths). Track freezing, automatic crossfading and a one-click system that automatically burns your current project to an audio CD are also on offer. Mixcraft 4 is refreshingly straightforward, much like the Apple software that inspired it. The interface is logically designed and clear-cut, while still retaining a good level of functionality. Even so, absolute novices may still be scratching their heads on their first go, and the supplied help file would be much more useful if it were a printable PDF with better illustrations. A more serious concern, though, is that, as in Mixcraft 3, looping playback of a song section results in a glitch whereby a tiny amount (it seems to vary) of the audio after the loop-end point plays before the ‘play head´ returns to the beginning of the loop, meaning that a 4/4 loop can sound more like 17/16 in extreme cases! This can be quite jarring, and the fact that the glitch is still present is quite infuriating, as Acoustica reckoned it would be fixed for v4. Despite a few irritations, Mixcraft 4 is still a great application and possibly represents the best solution yet for PC-based computer music novices. A particularly satisfying aspect of the software is that you can use it at whatever level you feel comfortable with, from an eJay-style drag ´n´ drop fest through to a full-on sequencer, with massive stacked MIDI patches and multitracked parts. What´s more, Mixcraft´s incredibly reasonable price point and solid features make it one of the most value-packed DAWs we´ve seen to date, and we don´t hesitate to recommend it to those looking to get started or to anyone seeking a more straightforward experience than that offered by the majority of music applications.